Jim Palmer was the best American League pitcher of the 1970s as well as the greatest pitcher the Baltimore Orioles franchise has ever put on the mound. 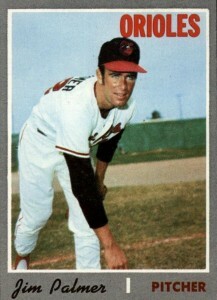 Palmer's long career with the O's made him one of their most popular players and his trading cards are are among the most valuable from the late 1960s and early 70s. 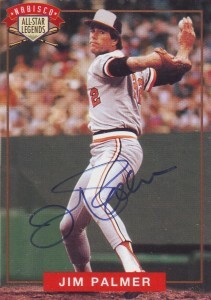 This top list features the best Jim Palmer baseball cards from throughout his career, including his valuable rookie card. 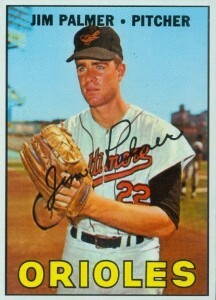 Shop for Professionally Graded Jim Palmer cards on eBay. 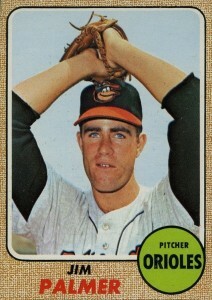 Debuting in 1965, Palmer immediately helped the Orioles reach a new level of success. He led the team to its first World Series win in 1966 and, at the age of 20, he became the youngest pitcher to throw a shutout in a World Series game. In total, Palmer and his Orioles teams would reach the World Series six times, making him the only Orioles player to appear in all of their Fall Classic appearances. 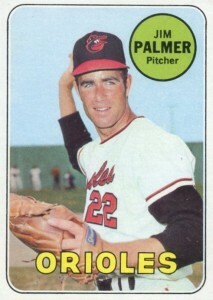 Along with the 1966 title, Palmer and the Orioles also won championships in 1970 and 1983. Building his accolades, Jim notched 186 wins during the 1970s, which was the most by any pitcher during the decade and he also added eight seasons with 20 or more wins in those ten years. Hardware came along the way as Palmer won the Cy Young Award in 1973 and in back-to-back seasons in 1975 and 1976. In total, Palmer would finish his career with a 268-152 record and an impressive 2.86 ERA. This made him the winningest pitcher in Orioles franchise history and secured his spot in Cooperstown. He was elected to the Hall of Fame on his first ballot in 1990. Because the baseball cards that feature Palmer number into the hundreds, many great cards weren't able to be included on this top list. Jim Palmer appears in many of the earliest sets that featured certified autographed cards on their checklists, including 1993 Front Row All-Time Greats, 1997 Donruss Significant Signatures, and 2000 Upper Deck Legends, most of which can be found for a budget-friendly price. More recently, you can find Palmer base and autograph cards in 2015 Topps Tribute, 2014 Topps Allen & Ginter, and 2014 Panini Hall of Fame. In 2013 Topps Archives, there is a Palmer card featuring the 1990 Topps design as one of the many "cards that never were" in the set. This is appropriate for Palmer as he attempted a comeback to baseball in the early 1990s and even attended spring training with the Orioles during the 1991 season. Jim Palmer's long career stretches from the days of high-numbered short prints to the beginning of the era of overproduction. In formulating this top list, value was the main factor along with card design and a desire to develop a comprehensive collection. Palmer's 1975 Topps card is a beautifully composed and takes advantage of the set's color scheme that would change from card to card. At this point in Palmer's career, he was coming off his only losing season during the 1970s (going 7-12 in 1974) but he would quickly turn it around and win the Cy Young during the next two seasons. This made him the winner of the award in three out of four seasons. 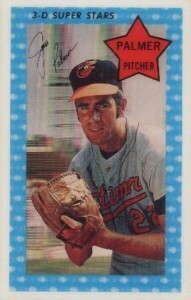 Jim Palmer made his Kellogg's debut in the 1971 set which has proven to be the rarest Kellogg's set overall. Like several cards from the release, his card has two variations based on a statistical error on the reverse side. In the initial printing of the cards, his career strikeouts total was listed at 564 when it should have been 567. The corrected version holds a slightly higher value. 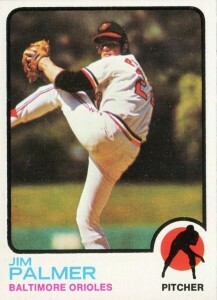 Palmer's 1973 Topps card features him in the middle of his windup and it is evident as to exactly how high he would kick up his leg to generate his powerful pitches. Those pitches would prove incredibly difficult to hit and, amazingly, throughout his career (which included appearances in 575 games), Palmer never gave up a grand slam or back-to-back home runs. 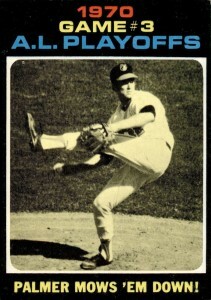 Along with his 1971 Topps base card and an American League ERA Leaders card, Palmer also has a card honoring his Game 3 pitching performance in the 1970 American League Championship Series against the Minnesota Twins. The Orioles would eventually win that series and the 1970 World Series. In total, Palmer would go 8-3 with a 2.61 ERA in his eight different trips to the playoffs. After missing the entire 1968 season, Palmer would storm back to success in the 1969 season, going 16-4. As his 1970 Topps card reminds us, he led the American League in winning percentage. 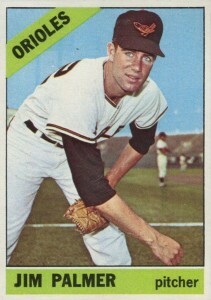 Palmer also threw the lone no-hitter of his career during the 1969 season by blanking the Oakland A's and, since then, only one other no-hitter has been thrown by an Orioles pitchers. After the success of the 1993 set, Nabisco issued a second set of autographs featuring baseball legends, including Palmer. Initially available for $5 and proof of purchase, the autographs are now valued at many times that. Palmer's autograph is famous for his first letter "J" looking like an "8" and the overall signature is written in one motion without ever lifting the pen. Jim Palmer would miss the entire 1968 season recovering from shoulder surgery but you can still find him in the 1969 Topps set. An interesting fact in baseball history, both the Kansas City Royals and Seattle Pilots expansion teams who joined the league in 1969 had the ability to draft Palmer in the expansion draft as the Orioles didn't protect him because he was injured. Both teams would decide to pass on the future Hall of Famer. After his breakthrough success in the 1966 season, Palmer's 1967 and 1968 seasons were filled with struggle and injury. While he only appeared in nine games during the 1967 season, Topps still included him in their 1968 set. It was during this early part of his career that Palmer would earn the nickname "Cakes" as he would routinely eat pancakes on the day he would take the mound. Jim Palmer made two appearances in his second-year set, 1967 Topps, and either card offers collectors on a budget a chance to get an early Palmer card at a fraction of his pricey rookie card. Along with the typical base card which features Jim about to begin his windup, he also has a World Series card that honors his record-setting shutout performance against the Dodgers in Game 2 of the 1966 series. 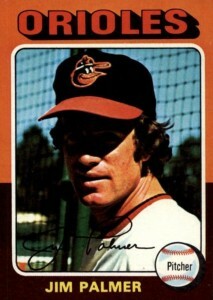 Palmer spent his first season with the Orioles as a relief pitcher, appearing in 27 games but only starting six. His rookie card from 1966 Topps praises him as one of the Orioles best prospects ever and he would live up to that praise just a season later. Palmer's premiere card has proven to be the most valuable rookie card from the 1966 Topps set with near-mint copies topping $700 at auction and mint copies reaching beyond $2,000. Are you kidding? No 76 Topps Palmer? 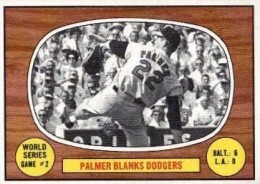 One of the most beautiful Topps cards ever with Palmer in fully stretched out coming home. You missed this one, bad. JIM PALMER 2004 UPPER DECK LEGENDS AUTOGRAPH AUTO SP!!! -ORIOLES!! !